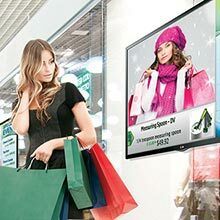 To achieve the best return on your investment, you need to use your digital signage system to its optimal potential. That's where Black Box can help. We not only offer one of the most feature-rich, yet user-friendly digital signage systems available today, we're experts in its use in different applications. Count on Black Box for best practices and content strategy advice that delivers real value to your organization. Once you have your digital signage content on the Content Commander CMS, you'll need a digital video wall controller to make it display properly on multi-screen video walls.